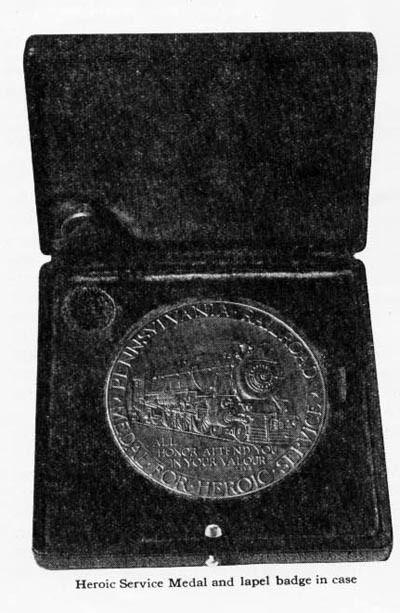 Decision to award medals to employes of the Pennsylvania Railroad, who perform unusual acts of heroism in connection with their regular duties, or while on the Company's property, was announced July I, 1923, by G. L. Peck, Vice President in Charge of Personnel, following authorization by the Company's Board of Directors. The motive of the Directors in establishing the award was to accord proper public recognition to those who, in connection with the discharge of duty, perform extraordinary service in the protection of life or property at the risk of their own safety or even of their lives. "Notwithstanding the provisions of mechanical safeguards, the nature of railroading itself is such that opportunities to protect life, limb and property occur in the ordinary course of a day's work, and Pennsylvania Railroad men have never been found wanting in the performance of their duties in this respect. "The record of the Pennsylvania Railroad in protecting the life and property of its passengers, shippers and employes is an achievement of which the management is justly proud. It is a tribute to the zeal and fidelity of Pennsylvania employes." Preventing, or attempting to prevent, accidents to persons or trains under unusual circumstances. Recommendations for the award of Heroic Service Medals are made by employing officers to a special committee which, in turn, investigates the merits of each case and then makes a recommendation to the Board of Directors. All officers and employes are requested to report any act of heroism which they believe merits consideration by the special committee. 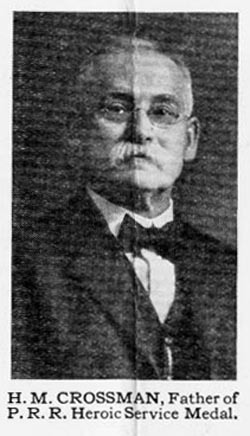 Henry M. Crossman, of East Aurora, N. Y., a machinist in the Ebenezer shop, Buffalo division, is the father of the Pennsylvania Railroad medal for heroic service. It was from Mr. Crossman's suggestion that the plan of awarding medals, as finally authorized by the Board of Directors, was developed. A general notice to all employes of the Central Region was issued in November, 1921, by Vice President J. A. McCrea, now dead, officially commending an outstanding act of heroism performed by a crossing watchman in saving a little girl from being run over by a passenger train. After reading this notice, Mr. Crossman wrote to Mr. McCrea and suggested that medals of appropriate design be awarded in the future, in cases similar to the one described in the general notice. He also suggested that presentation of a medal such as he had in mind should be made in a formal ceremony. Mr. McCrea recognized the merit of the general plan as outlined by Mr. Crossman and he later submitted a recommendation to the Board of Directors. The plan was favorably received and the award of medals for heroic service was formally authorized after a detailed program of procedure had been worked out and an appropriate design for a medal developed. Awards of the medals have thus far been made on two occasions. The more recent was February 10, 1926, when twenty-four were presented. The first was on May 28, 1924, when twenty-seven medals were awarded. In each case, the presentations were made by the President of the Company in the presence of the Board of Directors and the higher executive officers. The ceremonies on both occasions formed part of the official proceedings of regular Directors' meetings, in the Board Room at Broad Street Station, Philadelphia, and were duly recorded in the minutes as such. The medal for heroic service, both sides of which are reproduced on the cover page, is made of bronze and is 2% inches in diameter. The standard express passenger locomotive (Class K-4-s), now in use on the Pennsylvania Railroad, is shown on the face. Under this arc the words, "All Honor Attend You in Your Valour" (Livy). Inscribed around the rim of the medal is the following legend: "Pennsylvania Railroad - Medal for heroic service." On the reverse side is a large keystone, the official emblem of the Pennsylvania Railroad, encircled by a laurel wreath. The keystone contains a facsimile of the official seal of the Company, which was authorized by the Board of Directors in 1847. Inside the keystone and above the corporate seal, the name of the employe to whom the medal is awarded is engraved, as well as the date on which the heroic service was performed. The locomotive shown in the corporate seal is undoubtedly one of the three engines, probably the "Bald Eagle", built in 1836-37 by the firm of Garrett and Eastwick, of Philadelphia, for the Columbia and Philadelphia Railroad, now part of the Pennsylvania. 1. "Pennsylvania Railroad, Medals for Heroic Service, Their Purpose, Conditions of Award, and Holders". Pennsylvania Railroad Information, Philadelphia, March 1926, 3-4. Are you looking for CROSSMAN ancestors? If so, we suggest posting a query to our Community Message Board to get assistance from other researchers.